5 | 28 students enrolled. Certification in Online Currency Derivatives course is jointly certified by NSE Academy & Elearnmarkets (NSE Academy is a subsidiary of National Stock Exchange of India). This program aims to create awareness and develop a better understanding about the 'Currency Derivatives' product, so that the people working in the Currency Derivatives market segment can benefit the most. The program will enable a beginner understand about the product, ways of trading it efficiently and ways to control risks. The Currency Derivatives course imparts knowledge on the fundamentals of currency markets, specifically the Exchange Traded Currency Derivatives markets, how it acts as a risk management tool as well as the trading platform, i.e. mechanisms of trading, clearing and settlement related to Currency Derivative. Students enrolling for this programme will be given a “Certificate of Participation” from NSE Academy facilitated by Elearnmarkets.com, after successful completion of the course of Currency Derivatives. He shall also be given free access to related webinars conducted by Kredent Academy for further knowledge enhancement. An email query support, Question & Answer community platform will also be availed by the student for any kind of doubt clearance related to content while pursuing the course. Dedicated hours of practical sessions providing exposure to hands-on trading. 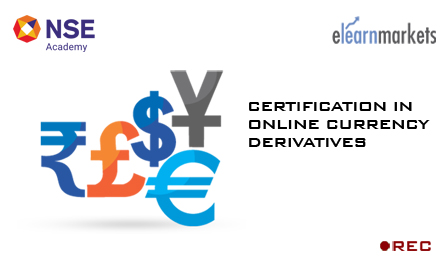 Certification in Online Currency Derivatives online course will help students, teachers, bankers, corporate executives, employees of Export/ Import Houses, analysts, employees of Brokers and Sub-brokers as well as anybody having interest in the Indian Securities Market.